The best electric snow blower can be found a cheap, safe and eco-friendly alternative to gas mowers. They come in both corded and uncorded with a variety of different motors. The great thing about choosing an electric one is that you never need to worry about running out of gas or getting out in the snow to get some (rather defeating the point if you need the blower to get your car out!). What Should You Know Before Buying A Snow Blower? 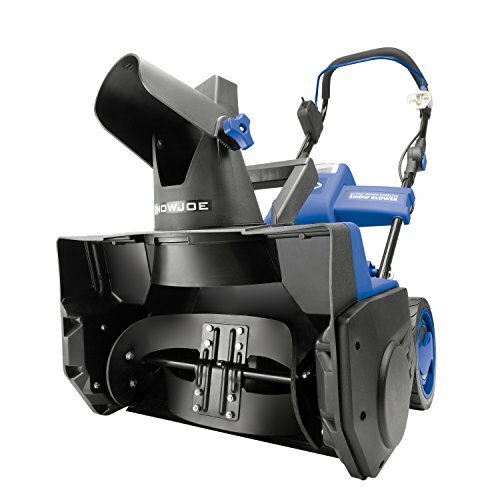 There are three main types of Snowblower, each having different features depending on user needs. These are Corded, Cordless, and Power Shovel. The power shovel is usually more lightweight and does not have a shoot like a traditional blower. This only works for lower snow amounts (<4”) and is ideal for decks and steps. A snow blower can either be cordless or corded and which is going to work for you will often depend on how far you’re willing to go. There is also a hybrid electric/gas type which uses gas for the motor but has all the features of an electric snow blower because it uses an electric start and electric adjustments. This is often a good compromise if you need power but are afraid of the hassle of mixing gas/oil or don’t want to throw your shoulder out with a pull start. Advantages Of A Snow Blower. Shoveling snow can be dangerous. Many people suffer heart attacks, slips, sprains, and injury from trying to shovel snow. Not to mention the fact that it’s very time-consuming. A snowblower is simple to use and just requires pushing it along so it’s also much quicker. While a shovel is obviously cheaper than a snow blower many are reasonably priced, especially if you’re willing to compromise like getting a Power Shovel instead. 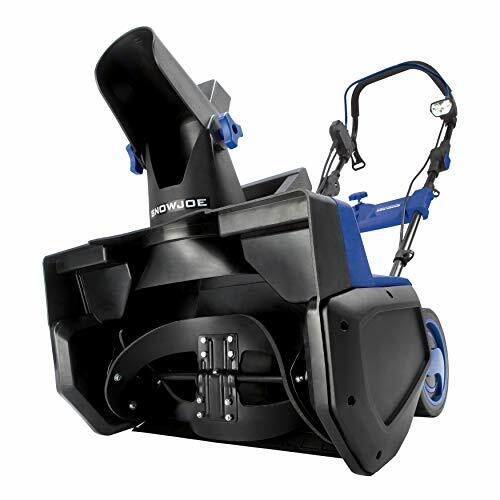 Electric snowblowers are usually lighter too which makes them less hazardous to use and easier to store. The motor turns rotor blades much like a lawnmower to mulch up the snow. There are usually 4 or more blades – the more blades the smaller the snow is mulched and the quicker it can break through. The number of blades dictates the plowing capacity and how long it will take to clear an area. There may also be blade assistance which makes it easier to push. Some snow blowers have a chute for the snow to come out and this can be directed so that the unwanted snow goes where you want (ideal if you’re going in more than one direction so you don’t dump snow where you’ve just blown). This may be coupled with a scraper blade at the back to make sure that all the snow is picked up from your path. All snowblowers use a motor, the larger the Amps on the motor the more powerful the machine and the more snow it can push through. A snowblower may also have a light at the front which makes it easier to see both at night and while the snow is still falling. It also makes you easier to see for safety, especially if you’re on the road. Snowblowers can be quite heavy depending on the size of the motor. A heavy machine is hard to push but will also have more power to it. Look at what sort of wheels it has too as this will determine how well it grips in snow and may make it easier to push even if it’s heavy. You can also find some with power assistance or gears to help offset this. Look for safety features like ones that prevent accidental starting and protective guards for the blades while cleaning. This will not only make it effective but much safer for you to use. Things like cord keepers, electric shut-offs, and safety levers. 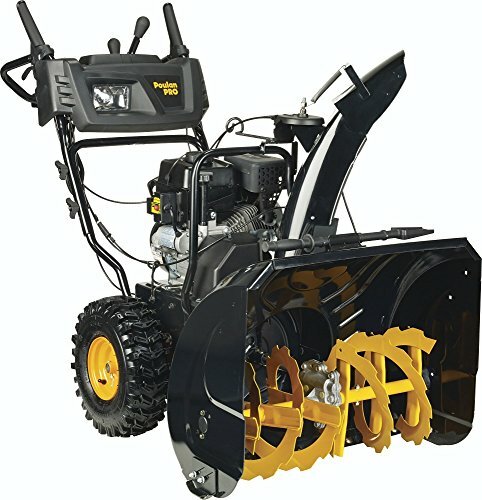 What type of electric snow blower is the best? If your drive is especially long or you want to be able to clean off the road as well it’s probably a good idea to go cordless. Corded snow blowers do tend to be more powerful and they’re often capable of being used on deep snow up to 10+ inches but their range is limited unless you want to use very long extension cords and even then it still has a limit. Cordless snow blowers are usually gas or battery powered and not very environmentally friendly. A Power Shovel is usually corded so it’s environmentally friendly but the lower power. If you have a big driveway our list of best electric snow blower will do the trick, while if you’re only dealing with a small pathway a power shovel may be more than adequate. What to look for when buying. When buying a now blower there are two main features to look at – the width and the throwing distance. The clearing width determines how much can be cleared in a single path, This is usually around 18” wide. The throw distance is how far away the snow is blown once it’s mulched up and pushed out the chute. This is important because if you’re blowing a large area you may end up having to clear the same snow twice if it does not blow it far enough away. 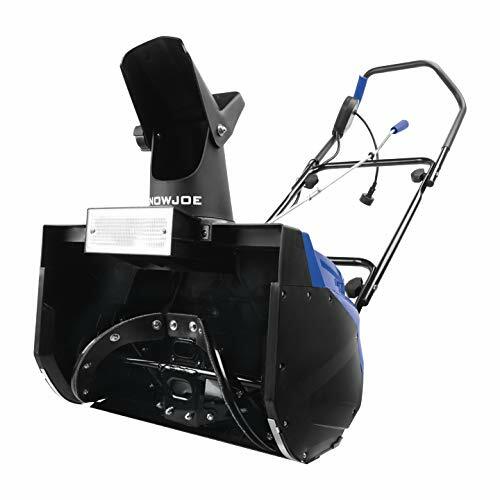 For medium areas, the Snow Joe Ultra has a decent sized motor and enough blades to get through 650lb of snow per minute. It’s a little bit hefty but has a wide and deep path so it has power too though it pushes only and has no blade assistance. The chute rotates for convenience and the wheels are pivoted which make it easier to move. It also has a scraper blade which has a rubberized edge to avoid damage to a deck or pavement. It’s quite cheap, especially compared to gas blowers and is also much smaller but still does a good job. While being corded is mostly a disadvantage it does mean you don’t have to fuss with batteries or with a gas/oil mix and worry about it not being right or charged when needed which makes it more dependable. 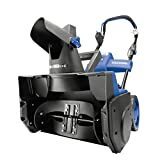 This is nearer the top end of the electric options and it’s certainly one of the largest but it falls short of capacity so you can consider it the best electric snow blower. At a similar price to the 24” Husqvarna this has a bigger engine and a bigger clearance. It has the similar hybrid concept with the electric start so that you’ve got the power of gas without having the hassle of pull starting or mixing. You’re also not going to be dealing with cords or charging which is a trade-off for not being so environmentally friendly. It’s also got impressive 12.5lb/ft torque to push it through the thickest snow. The 254cc engine also has friction-disc transmission and an electric start. The 180° turning chute has a remote for adjustment. It uses a ribbon auger to aerate the snow and make it easier to clear and dual stage processing to make the process faster. The engine is designed to withstand extra cold conditions and has extreme weather engineering. It can tackle snow up to 23” in height and has large 13” non-skid wheels. The headlights are large sized and it’s weighted to avoid tipping, though this makes it very very heavy even though the power steering does help stop this making it hard to push. It has a 5-year warranty and 6 operating speeds and it can be said that it is the best electric snow blower. A small convenient shovel that clears up to 6” of snow it has a 14” impeller that can tackle almost as much as a small snowblower and send just as far. It has a 10A motor that is quite small but is energy efficient. It weighs very little and has rubberized grips making it ideal for an older person. The handle is adjustable for comfort and there’s a cord saver to keep the extension cable from getting in the way. It has large 6” wheels and one of the main conveniences of the shovel over a blower is that there’s no oiling needed, just inspect the belt before use and replace as needed. The safety lever feature means that it will stop spinning if you release the lever, and this also acts as the on/off switch. It doesn’t have a chute but the vanes can be adjusted right or left to direct snow so it’s really only suited for light snows and not for large areas as the vane doesn’t shoot far if the snow is heavy. A powerful cordless that has a lot going for it. This is surprisingly light at only 32lb and has a large 40V/4A battery which is rechargeable (comes with a charger which can also be used for Sun Joe products) and can last up to 50 minutes on a single charge. The auger has only 2 blades and is limited to 495lb/minute but has an 18” path and up to 8” of clearance. The chute rotates a full 180° and can throw up to 20ft. The auger blades are rubberized to protect grass and decking and so is the front scraper blade. It also comes with additional gaskets and screws and has a convenient front light. It’s only intended to handle 6-8” snows but can be pushed through deeper at a slower rate, though it will drain the battery quickly and may jam the chute in place. It’s very light for the size and easy to move around. Having a brushless motor also means that it will have a cooler running temperature but that it’s more likely to end up with grit and dirt inside the motor which will cause it to burn out quickly. As one of the more expensive options, there are some very obvious reasons for the difference in price. At 24” this is a large clearance blower and it has a power of 208CC with an electric start. While it’s not completely electric the electric start means you get the best of both worlds – the power of gas but the convenience of electric. There are 15” tires with non-skid shoes making it ideal for all terrains and a remote for the chute rotation. It’s very heavy at 199lb and is a two stage blower with a friction-disc transmission so that it can pump out with a high capacity for 20′ or more throw. There are also LED headlights, handle grips, and an adjustable handle. The auger is a ribbon design which mixes air in with the snow so that it doesn’t clog and the transmission allows for them to change speeds depending on the type and thickness of snow. It also has a 2.7l fuel tank and a 5-year warranty, however, it does not have power steering which can make it hard to push, especially because it’s quite heavy. The electric-assisted start also means you don’t have to throw your shoulder out using a pull start for the motor and you won’t have to worry about priming or mixing fuel. The impeller blades are not steel which means they’re very prone to damage from rocks and debris which might get picked up as you go, there’s also no rubberizing to protect them from such damage. The hybrid concept also means that this isn’t as eco-friendly as a fully electric snow blower. This is pretty powerful for an electric blower. It has a large 21” path and a 15A motor which can move up to 800lb of snow per minute at a maximum of 12” depth. It’s very important to get a matching 15A extension cord or this power won’t be experienced when using it as the motor will be limited by a standard 12A cord. It has a 2-year warranty and while it is corded this means you never have to worry about running out of battery. There’s a 3W light and it has 2 rubberized blades on the auger and a front scraper blade. The chute rotates 180° and is much like the smaller iON18SB. It has all-terrain wheels which are easy to turn and solid so you don’t have to worry about tires. It’s a little heavy but still not as bad as a gas machine while still being almost as powerful. There is also power assistance so it’s not fully self-propelled. It’s more efficient than the iON18SB too because there’s no need to charge it and therefore more energy efficient as well. There’s not a lot of downsides to this mower as it’s almost as powerful as most gas or hybrids and it is still much more eco-friendly as well as weighing significantly less. This also does not have the safety switch that the smaller Snow Joe models have. When looking for the best electric snow blower there are a lot of options when it comes to power type and ability. Much of the choice has to be determined by how big of an area you’re trying to plow and how heavy your snow is. If you’re frequently getting deep and heavy snows or have a large area then the Snow Joe Ultra SJ625E performs as well as the hybrid/electric start types without having to deal with gas at all. Another reason that this is the best is that it’s clearly got the most well-rounded design even if it’s corded because you can always get a longer cord if you need to go further with it. It’s still eco-friendly, and it has an impressive throw range, depth, and a well-sized path. While it might be a little less than others for safety if you are using it with common sense this should not be an issue. I hope you liked our best electric snow blower liked our choices.